I sometimes think that working at the Cato Institute and trying to change Washington must be akin to working at a church in the middle of Amsterdam’s red light district. In both cases, you’re wildly outnumbered by people with a different outlook on life. And it’s not that easy to save misguided souls. The crowd in Washington, for instance, benefits enormously from a complicated tax system, a Byzantine regulatory regime, and a bloated budget. All of these factors create big opportunities for unearned income for bureaucrats, cronies, politicians, contractors, lobbyists, and other insiders. Telling those people they should back away from the public trough is not exactly a way to make friends in DC. 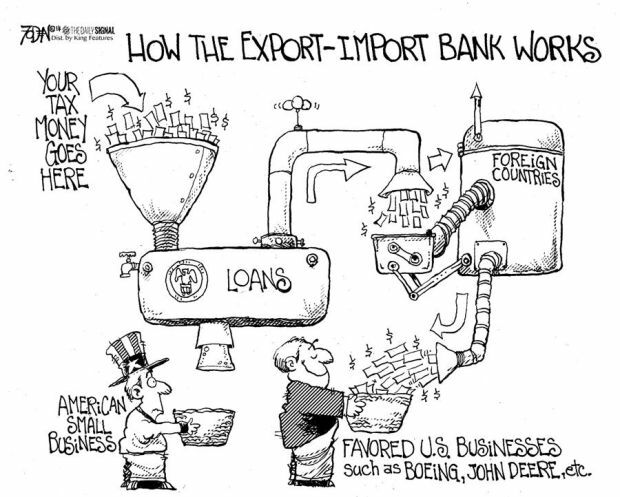 To cite just one example, look at how the Washington establishment is trying to defend the Export-Import Bank, a grotesque example of corporate welfare that is opposed by honest people on the right and left of the political spectrum. Or, if you want to be partisan, what about the Democratic insiders who are getting rich from Obamacare? Conversely, what about the Republican insiders who also get rich from big government? But maybe all these examples are too indirect. So today’s column will give specific examples of people who get undeserved wealth thanks to influence peddling in Washington. Here are some passages from a brutal expose written by Michelle Malkin for the Washington Examiner. She starts by looking at how Vice President Biden’s son got special treatment, first when he was handed a plum spot as a public relations hack in the Navy Reserve and then after he got tossed out after failing a drug test. Everything you need to know about Beltway nepotism, corporate cronyism and corruption can be found in the biography of Robert Hunter Biden. …The youngest son of Vice President Joe Biden made news last week after the Wall Street Journal revealed he had been booted from the Navy Reserve for cocaine use. …Papa Biden loves to tout his middle-class, “Average Joe” credentials. But rest assured, if his son had been “Hunter Smith” or “Hunter Jones” or “Hunter Brown,” the Navy’s extraordinary dispensations would be all but unattainable. …Despite the disgraceful ejection from our military, Hunter’s Connecticut law license won’t be subject to automatic review. Because, well, Biden. But special treatment apparently is nothing new for Biden’s son. And a lifetime of insider deals has been greased by the favor factory of big government. Skating by, flouting rules and extracting favors are the story of Hunter’s life. Hunter’s first job, acquired after Joe Biden won his 1996 Senate re-election bid in Delaware, was with MBNA. …Hunter zoomed up to senior vice president by early 1998 and then scored a plum position in the Clinton administration’s Commerce Department, specializing in “electronic commerce” before returning to MBNA three years later as a high-priced “consultant.” While he collected those “consulting” (translation: nepotistic access-trading) fees, Hunter became a “founding partner” in the lobbying firm of Oldaker, Biden and Belair in 2002. …Hunter lobbied for drug companies, universities and other deep-pocketed clients to the tune of nearly $4 million billed to the company by 2007. …Continually failing upward, Hunter snagged a seat on the board of directors of taxpayer-subsidized, stimulus-inflated Amtrak, where he pretended not to be a lobbyist, but rather an “effective advocate” for the government railroad system serving the 1 percenters’ D.C.-NYC corridor. …Hunter joined Ukrainian natural gas company Burisma Holdings — owned by a powerful Russian government sympathizer who fled to Russia in February — this spring. The hypocritical lobbyist-bashers at the White House deny he will be lobbying and deny any conflict of interest. At this point, some readers may be thinking that Democrats are the party of big-government corruption. I’ll agree, but then I’ll add a very important caveat. It’s possible that this description applies to more than one political party. Let’s look at the sordid details of a story about GOP lobbyists and political hacks taking dirty money to push for big government. First, some background. For those of you who haven’t heard about “Obamaphones,” you’ll be delighted to learn that our bloated federal government has an entitlement program for cell phones. The Federal Communications Commission program…charges a dollar or two per line on every American’s phone bill. The revenue generated by the “Universal Service Fund fee” is then used to pay select phone companies $9.25 per month for each poor person they sign up for a free phone. …its cost doubled in five years to $1.75 billion in 2011, and in some states, the number of phones given out exceeded the total eligible population. …The company that has received the most income from the Lifeline program is TracFone, whose CEO, F.J. Pollak, was an Obama campaign fundraiser. The company spent nearly $1 million on lobbying last year. While an Obama donor is making big bucks off this federal handout, there also are a number of Republicans who are willing to agitate for wasteful spending so long as they get their pieces of silver as well. Mary Cheney and prominent Republican consultants linked to Karl Rove, Mitt Romney and the Republican National Committee are working to expand or protect the Obamaphone entitlement program, apparently on behalf of the telecom companies that make millions on it. …The strategy is aimed at convincing congressional Republicans…to back off of their opposition to the Obamaphone program, which has no connection to veteran status and is more commonly associated with welfare. …The FCC paperwork also lists the names Patti Heck, who is president of Crossroads Media, and Main Street Media Group, a Crossroads affiliate. Crossroads Media has ties to Rove’s American Crossroads…and shared an office used by several political shops employed by Romney’s 2012 presidential campaign. And you won’t be surprised to learn that these Republican influence peddlers are willing to engage in loathsome demagoguery. The ad’s voiceover says “some in Congress want to take away his phone,” implying that not having it would endanger him because of his cancer. …Bennett unabashedly defended the Obamaphone and other entitlement programs. “Of course I support these programs, because I don’t hate poor people,” he told the Examiner. Yup, if you don’t support a federal cell-phone entitlement program, you want veterans to die of cancer and you hate poor people. How do these people sleep at night?!? Ugh, I want to take a shower after having read both of these stories. Now you see why I always say that Washington is a racket for insiders to get rich at our expense. Fortunately, the article does quote some other people who are disturbed by this philosophical corruption. Bill Allison, a lobbying expert at the Sunlight Foundation, said the fact that major Republican consultants are promoting an entitlement program shows that “in Washington’s mercenary culture, there are few principles that stand in the way of a payday.” …“Wow. Just wow. Big government money ensnares a lot of people,” said David Williams, president of the taxpayers group, when told of Jansen’s new client. By the way, this doesn’t mean everybody in Washington is sleazy. And even the ones that are corrupt on some issues may be principled on others. But the incentives to “play the game” are enormous. As I explain in this video, big government is inherently corrupting. P.S. Folks are emailing me to ask me predictions for the 2014 mid-term elections. I’m not sure why anyone should care. Yes, I did a good job in 2010, but my 2012 predictions were not very impressive. That being said, I’m happy to oblige. We’re 10 days from the election, so I’ll make a set of predictions today, then another set of predictions with five days to go, then a final set of predictions the day before the election. For the House of Representatives, I can say with near-100 percent certainty that Republicans will maintain control. Indeed, I suspect they’ll pick up some seats and have a bigger majority. How big? Let’s go with 246-189, the biggest GOP margin since the late 1940s. But what about the Senate? The race for partisan control on the upper chamber is getting all the attention. In the for-what-it’s-worth department, I think Republicans will take control by a 52-48 margin, meaning a net gain of seven seats. 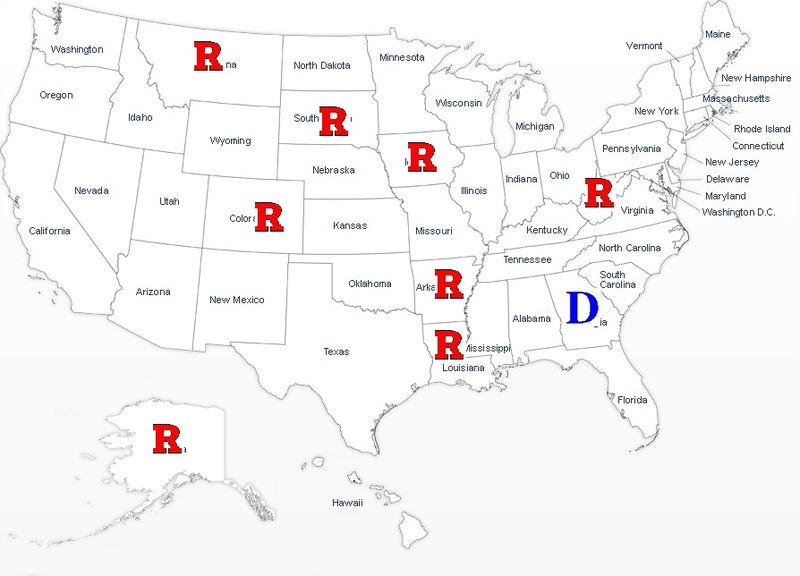 Here’s a map showing the seats that will change hands, though I confess Iowa, Colorado, and Georgia could go either way. It’s also possible that Republicans could lose Kansas, while the Democrats could lose North Carolina and New Hampshire. In other words, the final results could be anywhere between 55-45 Republican control or 52-48 Democratic control. P.P.S. If Republicans take control, don’t hold your breath waiting for big changes in policy. Even if they don’t get corrupted (like the Obamaphone-loving GOPers described above), the White House will still be controlled by Democrats. So there won’t be any tax reform and there won’t be any entitlement reform. Though there may be some fights in the next two years that help determine whether those things can happen after the 2016 election. on October 31, 2014 at 3:24 pm Bureaucratic Swine at the Trough « RichardCYoung.com ( Nothing really changes–just fighting over the spoils of Empire) | Finding Trout In Your Milk? Corruption of the West is not about left vs right, GOP vs Dems, Socialism vs liberty. This is war on White people. Why do hostile elite defend Israel as a Jewish ethnostate with Jewish only immigration, but ravage White majority Europe/North America into a multi-ethnic, multi-cultural Gulag with non-White colonization? The world is 93% non-White, only 7% White. But non-White colonizers are aggressively advancing their agenda to annihilate gullible Whites, just as Chinese annihilate Tibet. How long will gullible Whites cuckold for murderous anti-White elite, who suppress our fertility, confiscate our guns, infiltrate/subvert our banks/FBI/CIA, indoctrinate White kids in academia/mass media, plunder White jobs/wages, & butcher White soldiers in bankrupting wars? “Native” Americans invaded from East Asia. Yellow & Brown races committed 10-times more genocide, slavery, imperialism than Whites. Since Moses, Whites have been victims of Jewish/Crypto-Jewish, Muslim, N.African imperialism, slavery, genocide. While I would not hold my breath waiting for true changes, What I would like to see is a raft of conservative bills hitting Obama’s desk that he would then have to veto, putting a spotlight on the question of why the democrats want to prevent economic growth and measures that would restore America’s position in the world stage. That sort of spotlight could have the chance of ushering in big changes in 2016. Question is whether the republicans could put forth a true Reagan republican, or whether they’d feed us more milquetoast material like Romney and McPain. I have lost my faith in the republicans after their lukewarm approach to conservative/ libertarian values. Rove and Priebus must go for any of that faith to be restored.